Researchers are increasingly interested in the role certain dietary supplements may play in mood disorders and cognitive functioning. Flaxseed oil, made from the seeds of the flax plant, may provide a number of benefits for mood and brain functioning. Do not use flaxseed oil in place of conventional medical treatment. Omega-3 fatty acids are necessary for maintaining proper health. 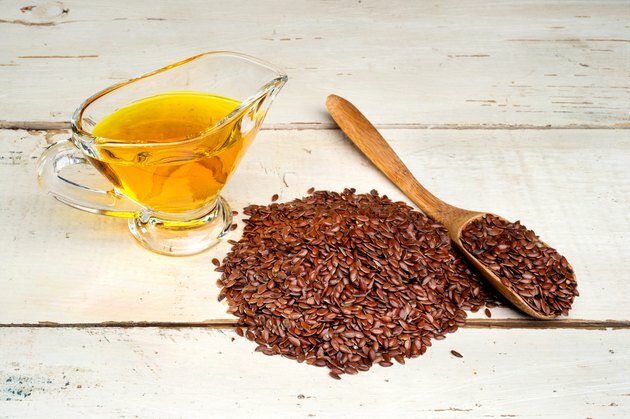 According to the University of Maryland Medical Center, flaxseed oil contains alpha-linolenic acid, or ALA, which your body uses to manufacture eicosapentaenoic acid, or EPA, and docosahexaenoic acid, or DHA. While you can synthesize EPA and DHA from ALA, it's not a very efficient conversion. Because of this, flasxeed oil may not be as beneficial as fish oil for omega-3s, but it is still better for you than nothing if you don't want to consume fish or fish products. EPA and DHA are omega-3 acids commonly found in fish and fish oil supplements. Omega-3 acids may be beneficial for lowering cholesterol levels and the risk of heart disease and reducing inflammation. A deficit in omega-3 acids can lead to symptoms of fatigue, mood swings and a number of cognitive problems such as poor memory and decreased concentration abilities. Omega-3 acids may provide a number of benefits for improving mood and enhancing cognitive functioning. A review published in the June 2006 issue of the "American Journal of Psychiatry" suggests that deficiencies in omega-3 fatty acids may play a key role in the development of mood disorders. A study published in the May 1999 "Archives of General Psychiatry" showed that omega-3 fatty acid supplementation had a beneficial effect on patients suffering from bipolar disorder. Patients treated with omega-3 fatty acids experienced a longer period of remission from symptoms with no negative side effects. Another study, published in the August 2003 issue of the journal, "European Neuropsychopharmacology," showed that omega-3 supplementation was helpful in reducing symptoms of major depression in study participants. However, no studies are available to suggest the benefits of flaxseed oil for improving mood in the general population. More clinical studies are needed to confirm the specific benefits of flaxseed oil on mood and mood disorders. A number of studies have demonstrated the benefits of omega-3 fatty acids on brain functioning. One study, published in the June 2006 issue of the journal, "Experimental Gerontology," showed that omega-3 supplementation provides a mild protective effect against the development of age-related cognitive impairment. Another study, published in the November 2005 issue of the "European Journal of Clinical Investigation" studied the effects of omega-3 supplementation on cognitive functioning and mood in healthy volunteers. The results found a beneficial effect on attention and complex cortical processes as well as improved mood. A systematic review published in 2006 in the journal, "Dementia and Geriatric Cognitive Disorders" states that limited clinical evidence suggests that omega-3 supplementation may help reduce the risk of dementia. Despite these results, more clinical studies are needed to evaluate the specific benefits of flaxseed oil on cognitive functioning. While flaxseed oil may provide benefits to mood and brain functioning, clinical evidence confirming these benefits is still limited. Do not use flaxseed oil to self-treat any medical conditions you may have. Seek your doctor's advice for any physical or mental complaints. According to the University of Maryland Medical Center, flaxseed oil may cause interactions with certain medications. Consult your doctor before using a flaxseed oil or another omega-3 fatty acid supplement, especially if you have any medical condition or take prescription or over-the-counter medications.